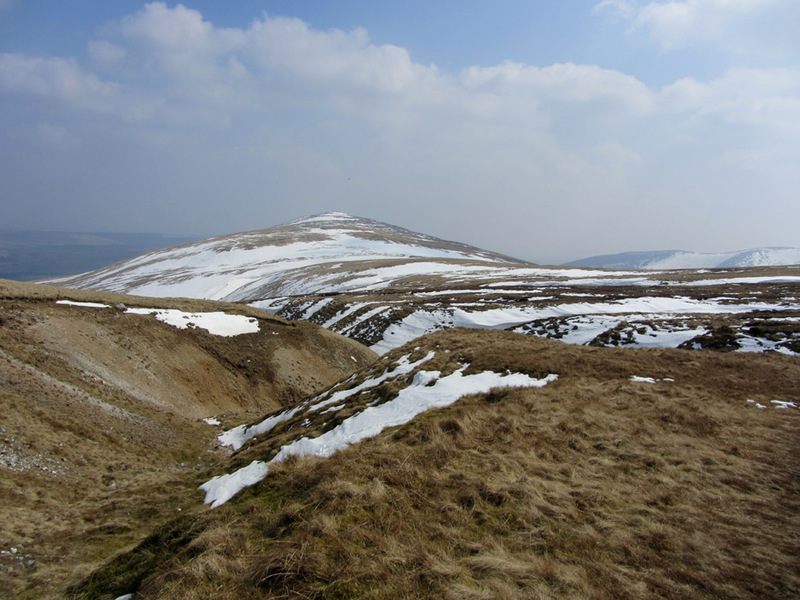 " Carrock Fell and High Pike with Brina "
Date & start time: Wednesday 10th April 2013, 11 am start. 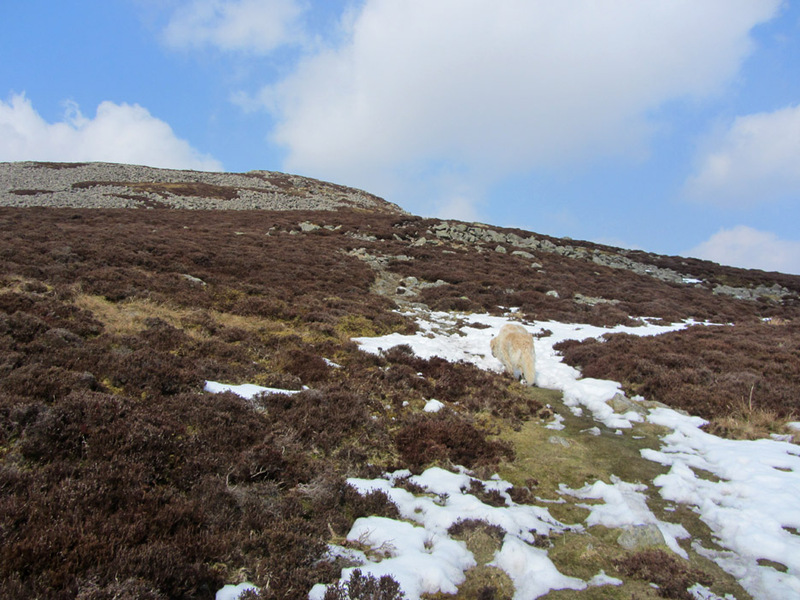 Places visited : Carrock Fell, Dry Gill, High Pike, Carrock Beck and back to the car. 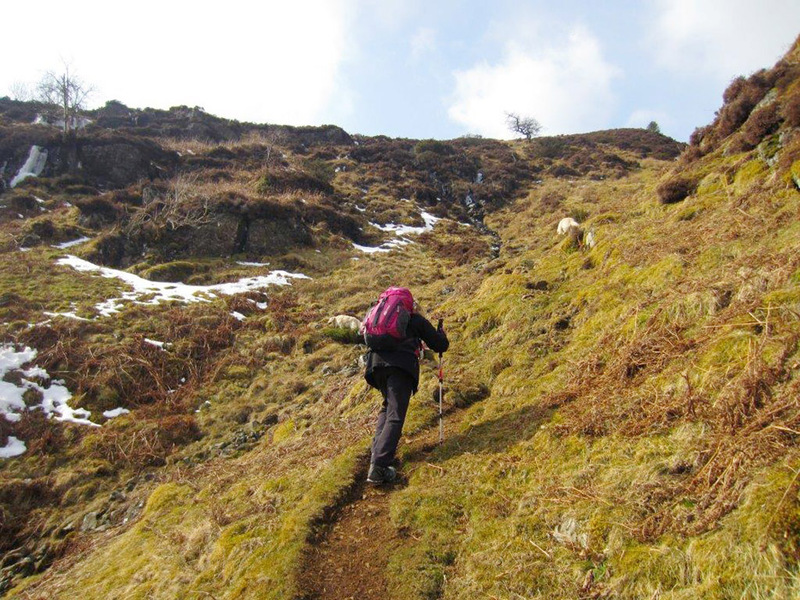 Walk details : 6 mls, 1825 ft of ascent, 4 hours 55 mins. 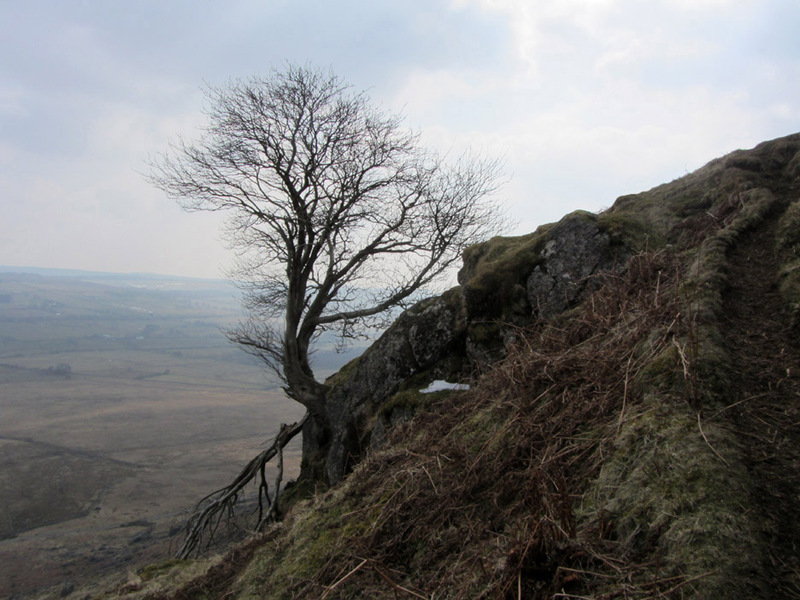 Highest point : Carrock Fell, 2165 ft - 661m. Walked with : Brina with Becky's dog Lucy. 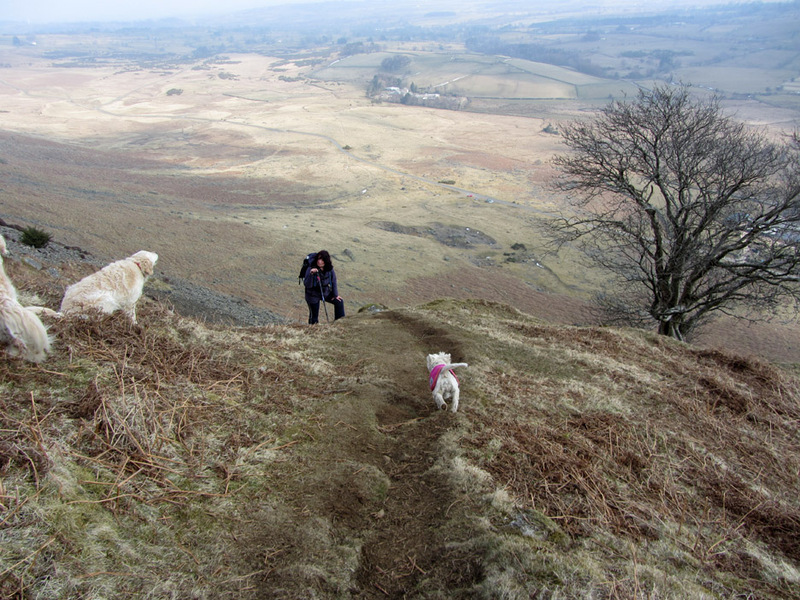 Ann and our dogs, Harry and Bethan. Weather : Sunshine but a little hazy at times. A little warmer due to the lack of wind. Ann joins her friend Brina, whom she last met in Calvert Trust several years ago. 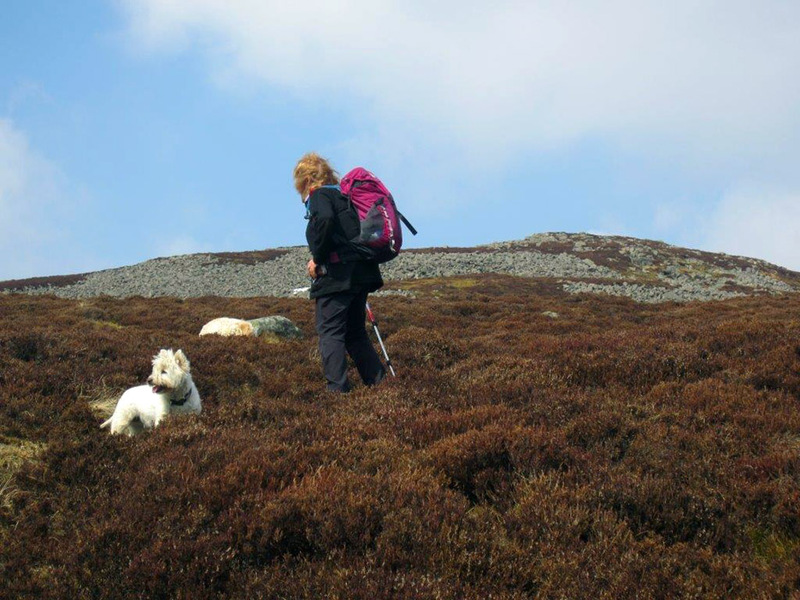 Together they take advantage of the weather to climb Carrock Fell, include High Pike in a round trip over in the Caldbeck Fells. We meet at the Apronful of Stones, opposite Stones End Farm . . . aren't Lake District names wonderful ! ? Looking up to our route of ascent towards those trees on the skyline. Lucy the dog waits for Brina . 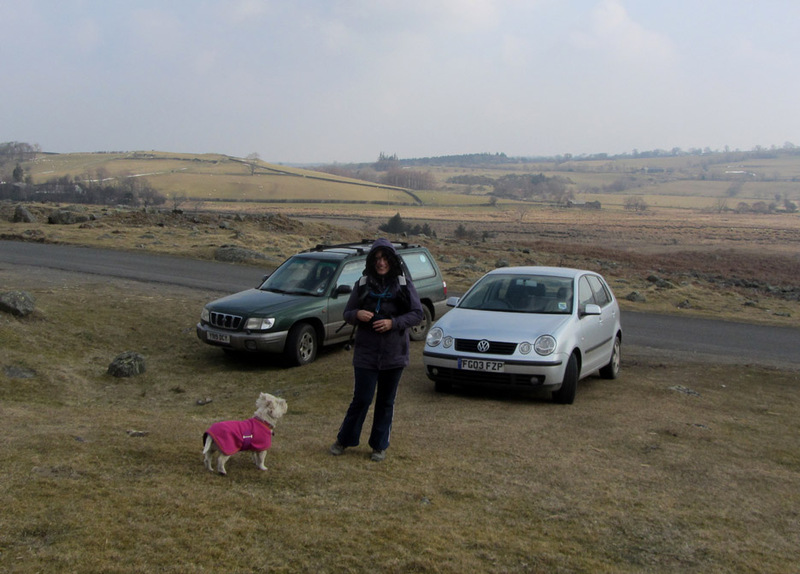 . . in her fetching pink coat she adds a nice touch of colour to the winter landscape. The cars can be seen down below near the roadside the other side of that "Apronful of Stones". The tree seen from below hangs tenaciously to the rock face. Hold your cursor over the picture to see who pops up on the skyline ! 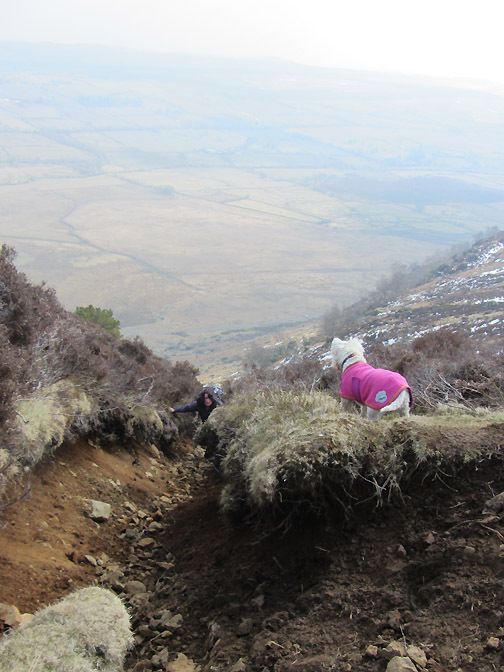 Bethan urges Brina up the slope . . . and Lucy rushes over to help. Brina's photo of myself as we continue upwards. 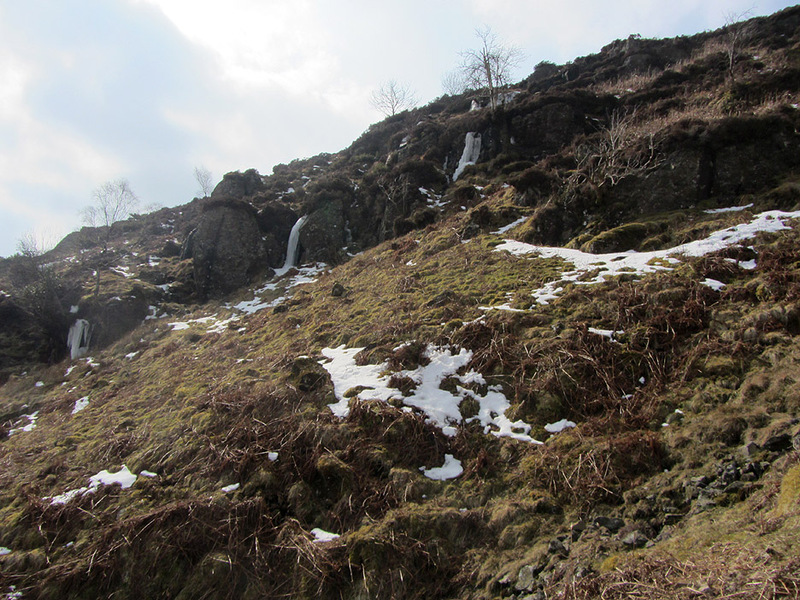 All the waterfalls are still frozen. Ever encouraging, Lucy waits . . .
. . . Brina now appears in the eroded gully. In the meantime, Harry is playing hide and seek ! 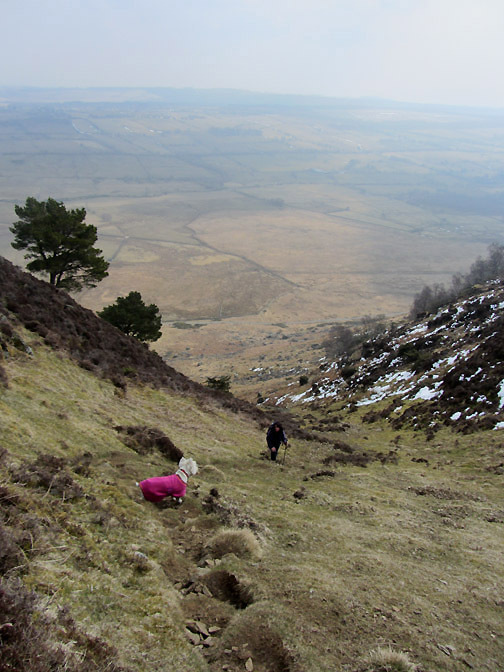 Bethan and Harry on the next part of the climb towards the sheepfold. 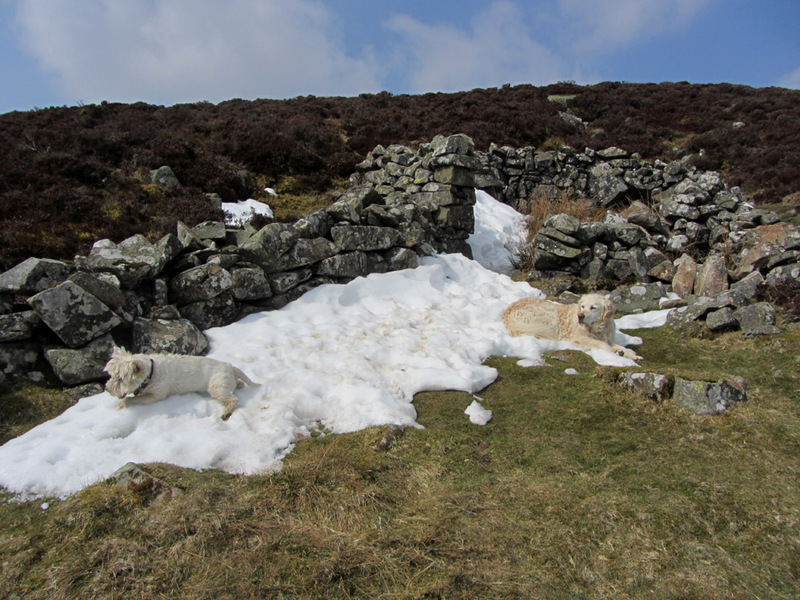 Before we reach the summit the dogs cool down in a drift of snow next to the walls. Lucy's 'party-trick' is to slide down on her tummy . . . especially on snow or wet grass. Another photo from Brina as we continue on to the summit. Ahead there's an old wall and ditch arrangement surrounding the ancient summit fort. 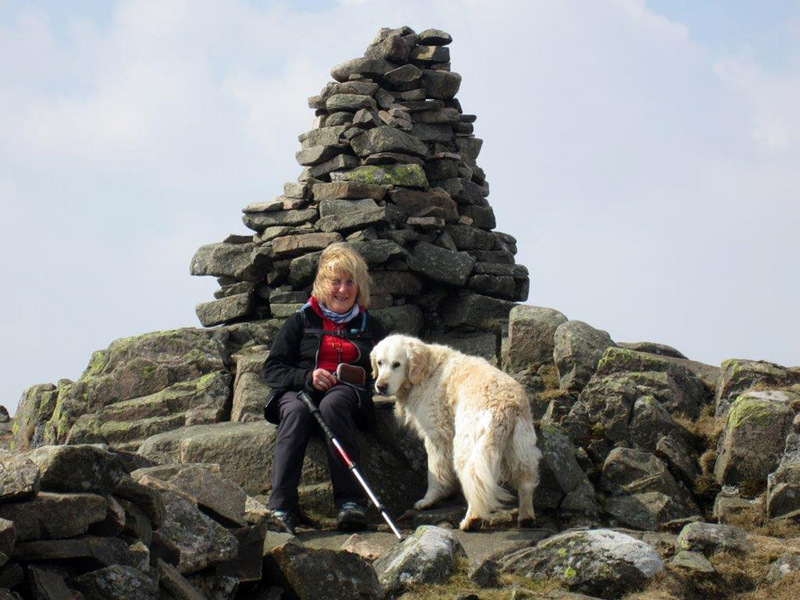 Summit of Carrock Fell attained . 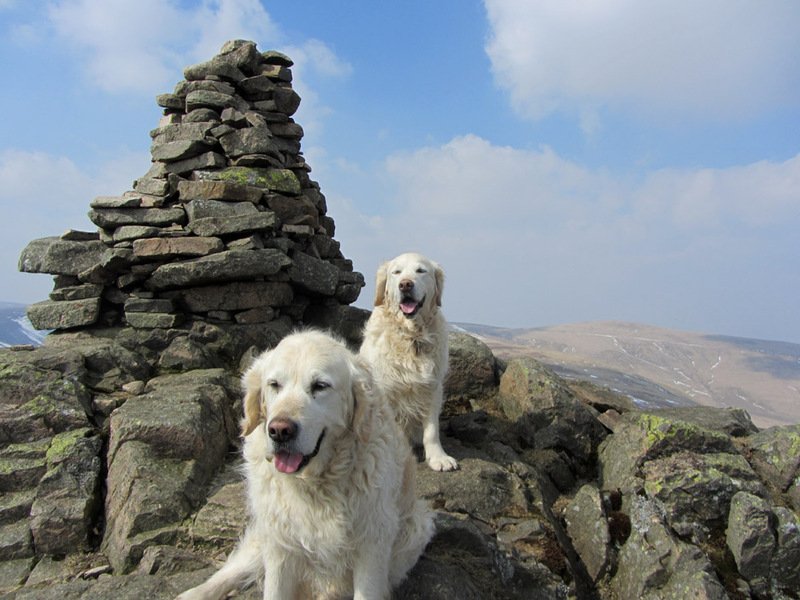 . . we sat in the cairn just below for our lunch. 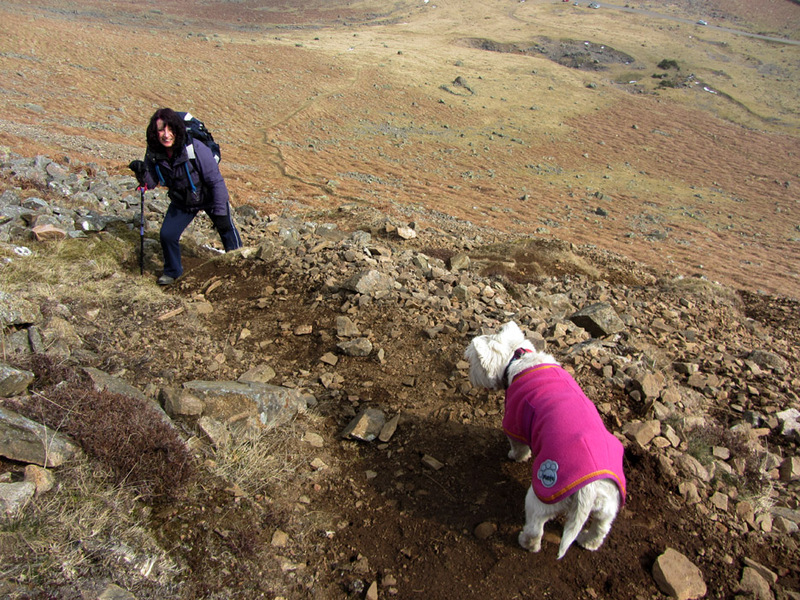 I believe this is the first time I have been on this summit when it isn't blowing a hoolie ! Nevertheless it is still a bad hair day for me . . . if not for Bethan. Her fur seems scarcely ruffled ! 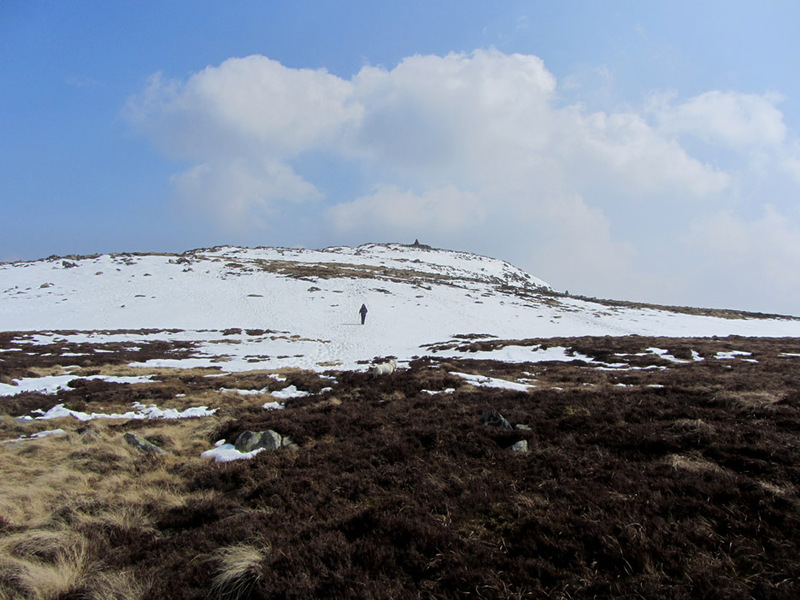 More snow on the downward side of Carrock Fell as we set off to walk along to High Pike. Knott is the high fell centre right . 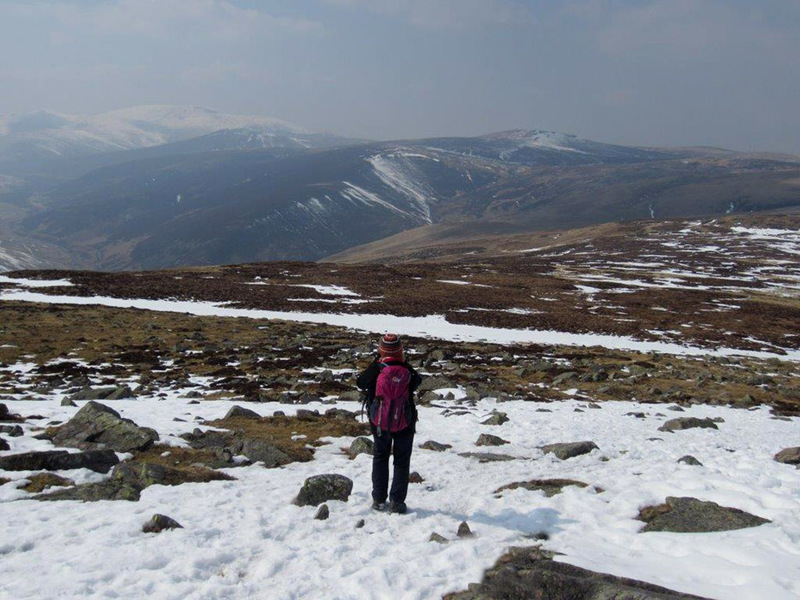 . . with Great Calva then distant Lonscale and Skiddaw to the left. 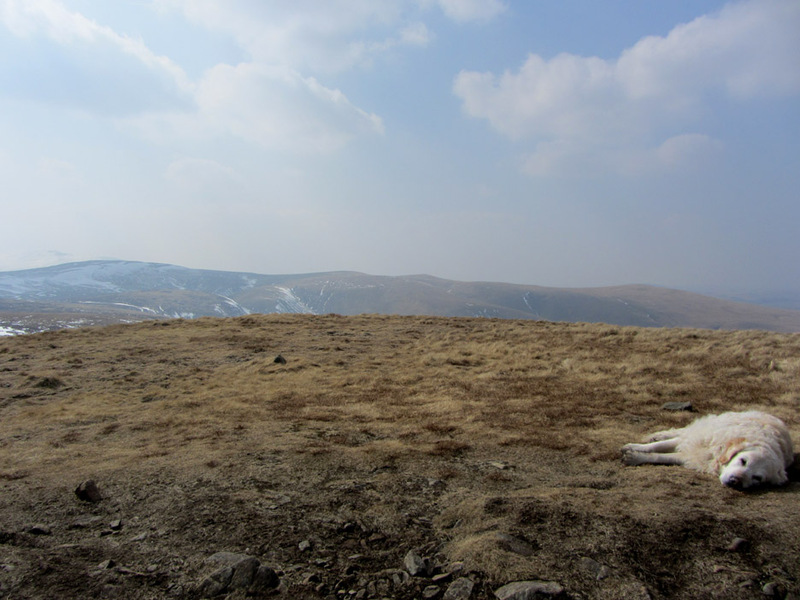 Looking back at the summit of Carrock Fell. 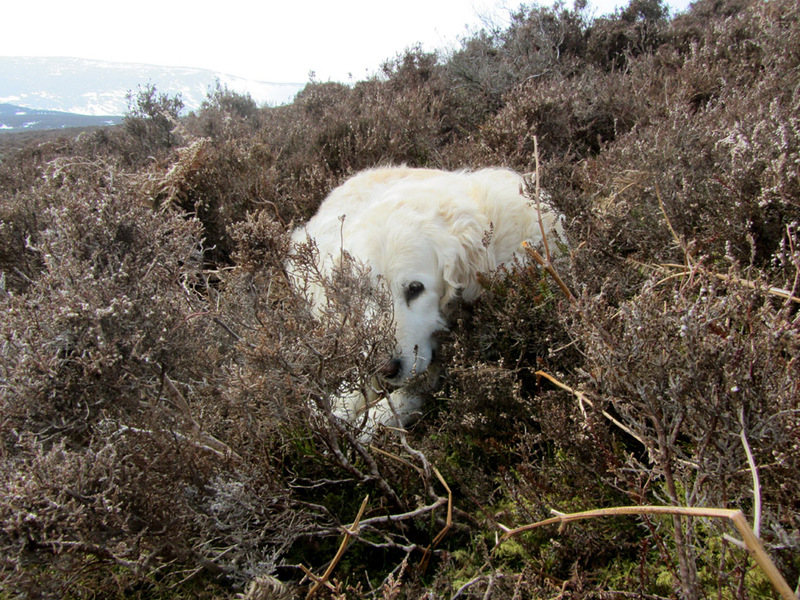 Spot Lucy waiting for Brina on the edge of the heather. 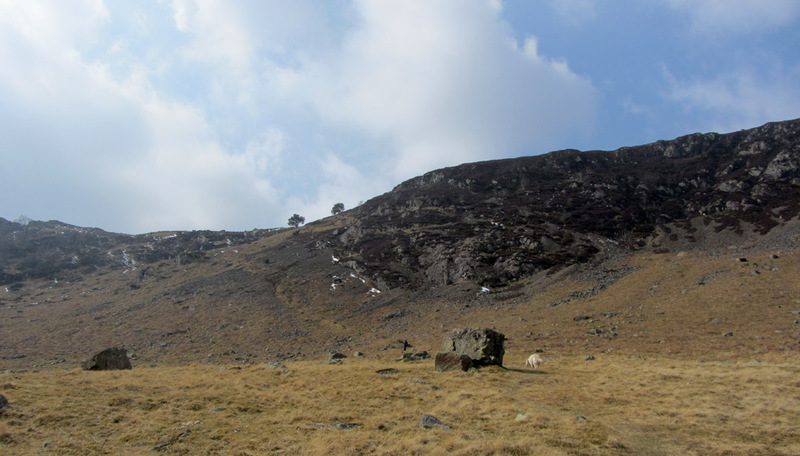 Another photo looking back at Carrock Fell. 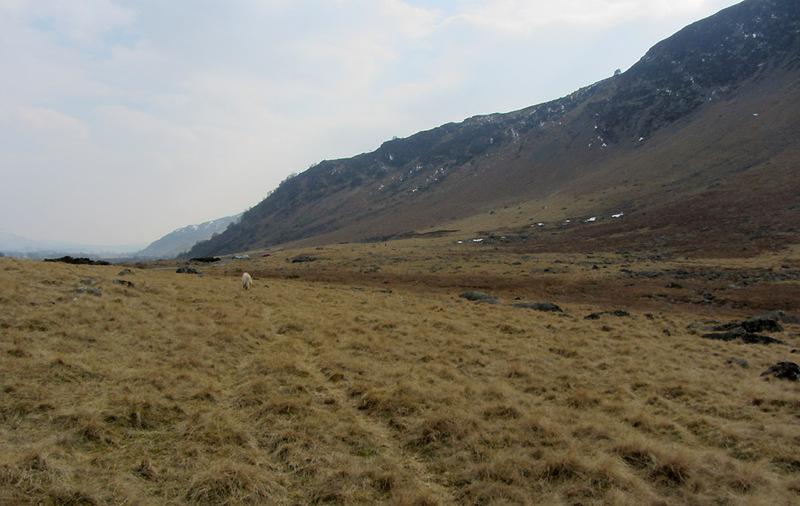 The slopes of Bowscale Fell are across the valley on the right hand side. 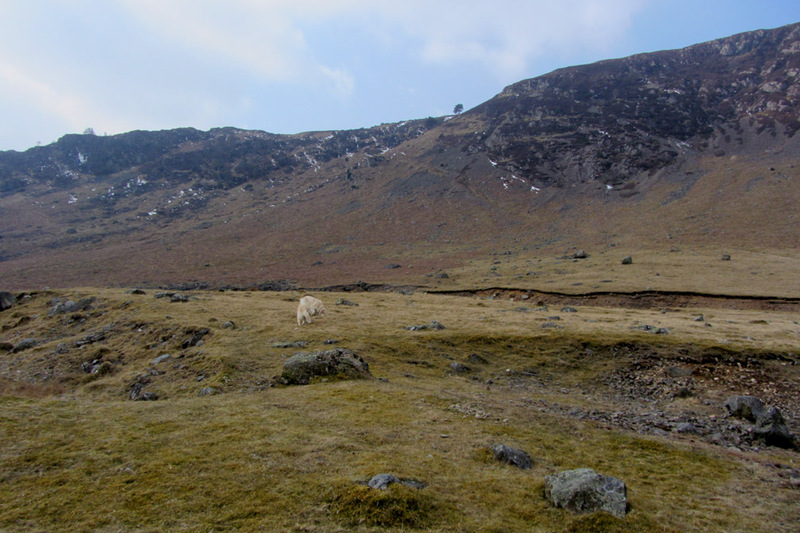 The head of Dry Gill as we make our way around on the path leading to High Pike. 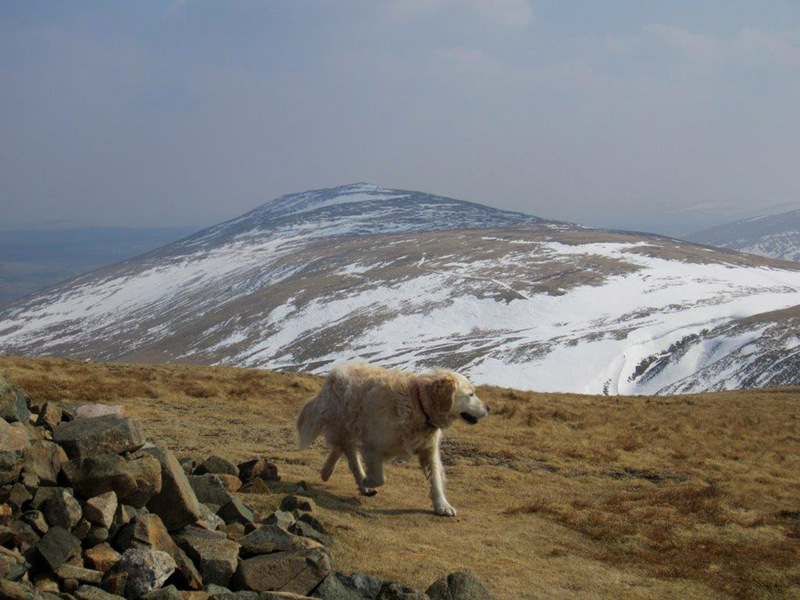 High Pike summit . 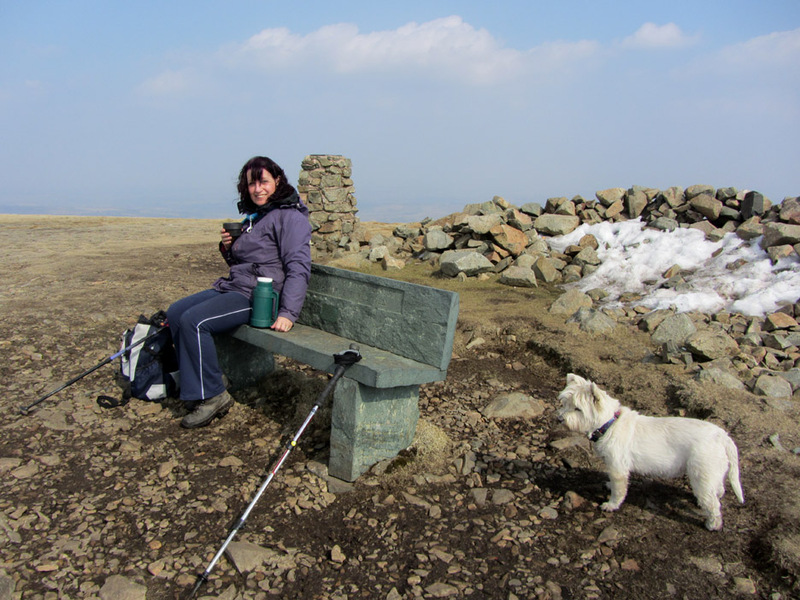 . . and a cup of tea and cake for Brina on the slate seat at the top. 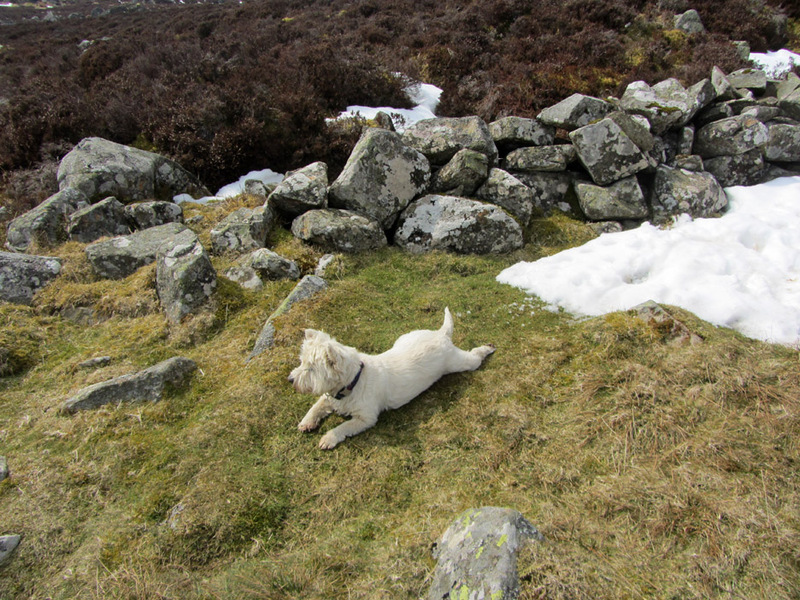 Harry grabs the opportunity for a lie-down . . .
. . . but not Bethan who continues 'on the hoof ' exploring the area around the summit. Time to descend besides the mine workings and alongside Carrock Beck to the bottom of the valley. 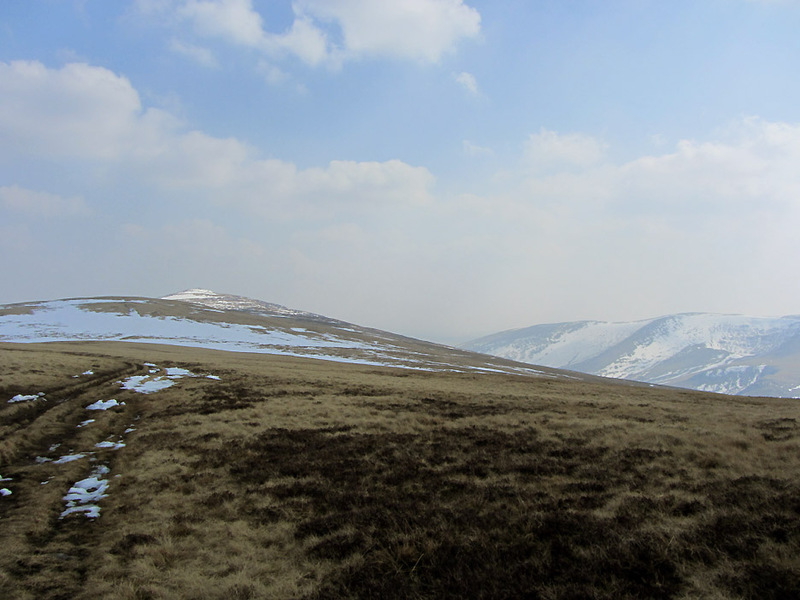 Our ridge walk from Carrock Fell can be seen on the right. 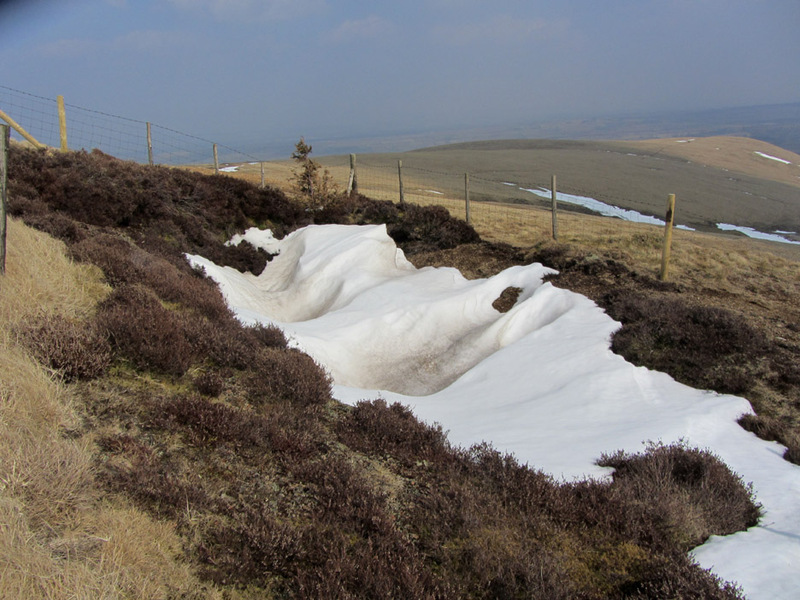 This fenced-off deep mine shaft is filled with snow today. 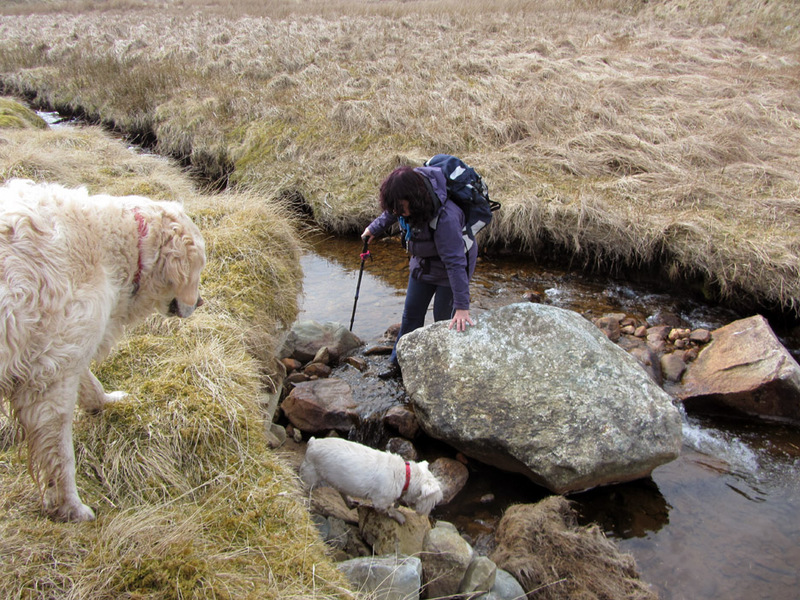 Having reached the beck, we cross over to walk back towards the cars. 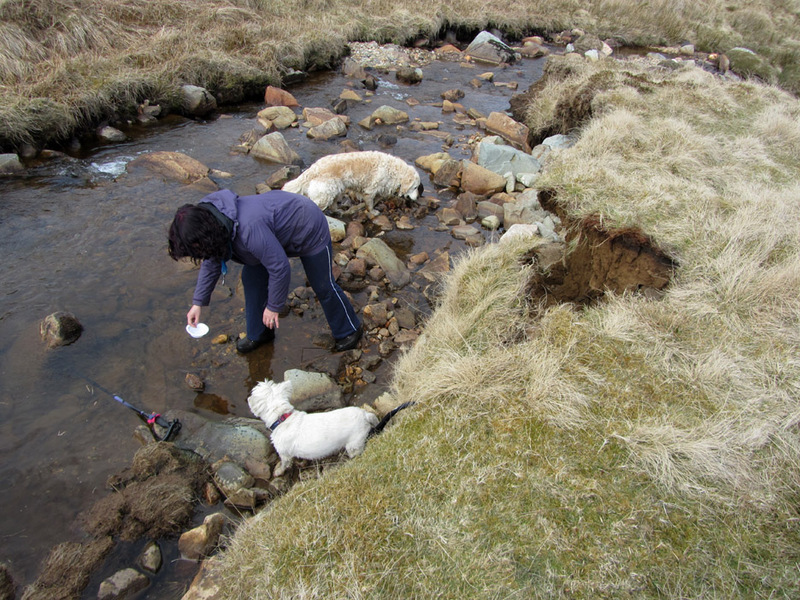 Brina collecting water for Lucy who doesn't like to drink from a beck ! 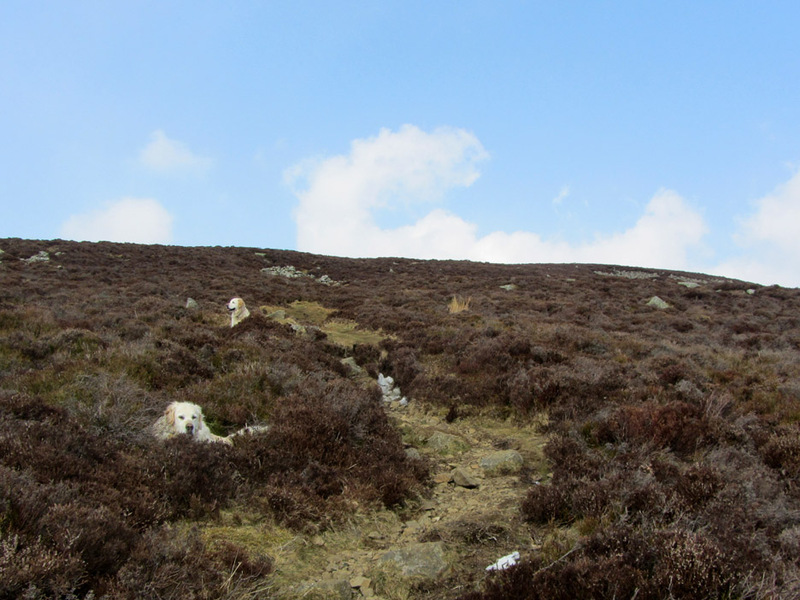 Our route along the flat but rather boggy ground beneath Carrock Fell. Back to our cars parked at the base of the ascent route that we used this morning. A fine walk . . . thank you Brina for suggesting it and for providing some of the photos. Technical note: Pictures taken with either Ann's Canon Sureshot SX220 or Brina's digital camera. This site best viewed with . . . two Retrievers and an energetic little Scottie Terrier.